In your owner’s manual you can find your Factory Scheduled Maintenance suggestions. This when they think you should have oil changes along with other preventative maintenance services performed on your vehicle. Regular maintenance can be one of the efficient ways to keep your vehicle at it’s peak level of performance. It is important to keep in mind that your Factory Scheduled Maintenance is based on ideal driving conditions. This means that if you have a stop and go commute, drive in extreme weather or tow heavy loads, you may need to have your car, truck or SUV serviced sooner than your manufacturer’s suggestions. Once we get to know you and your vehicle we can offer you maintenance schedule that works for both you and your wallet. We will never suggest a service that is unnecessary and we work hard to be your premier dealership alternative. We will make sure to honor any warranty that your vehicle may be under and we can provide you with and independent warranty of 36 Months / 36,000 Miles because our name Custom Auto Care means that we tailor a maintenance schedule to your needs, we also offer 12 Months / 12,000 Miles free roadside assistance, be sure to ask us for details. We know that you are looking for peace of mind when it comes to automotive repair and that’s exactly what you get every time you bring in your vehicle to have it serviced by one of our professional technicians! All in all we just want to make sure that you and your passengers are safe on the road. Any type of regular maintenance is the best way to avoid accidents due to parts failing prematurely, roadside breakdowns and those times when you’re stuck in a mall parking lot because your car won’t start. We care about our customers and we want to provide you with the best quality customer service possible. That’s why we will provide you with a prioritized list of services and repairs that will be needed in the future and when you should most likely have them performed. Because when you “need” a service that generally means a small issue had time to develop into a much larger problem. 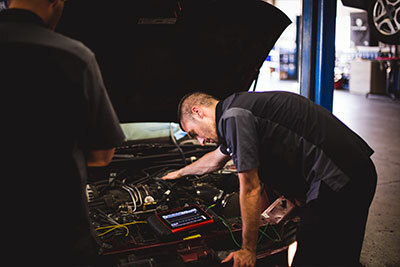 So if you’ve been experiencing symptoms while driving that indicate you may need to have a repair or maintenance service performed on your vehicle, give us a call with any questions you may have, drive on by our shop if you’re close or schedule an appointment online for a day and time that works for you!